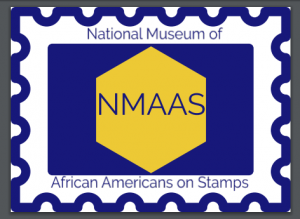 A stamp collector for over 26 years and known as “TheStampKeeper“, Charlene Blair has turned her hobby into a nonprofit organization to help bring greater awareness and education about the many African Americans that have been honored on U.S. stamps. She is an award-winning exhibitor and IL Chapter Chair of the Ebony Society of Philatelic Events and Reflections (ESPER). She is also a member of the American Philatelic Society (APS) and the Association of African American Museums. She began collecting in 1991 after reading an article in Jet Magazine about the 14th black heritage stamp being issued. Charlene began her journey of obtaining stamps from a local stamp dealer and started attending stamp shows. Beginning with the black heritage series, the oldest commemorative series by the USPS, she expanded to other African Americans on stamps. Charlene has been sharing her collection and related articles and information on Facebook for over five years but now has an official 501(c)3 and Gold Award designation from GuideStar.org. She has a Bachelors in Business Administration/Management from SIU-Edwardsville, IL and a Masters in Management from Walden University.